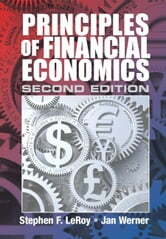 This second edition provides a rigorous yet accessible graduate-level introduction to financial economics. Since students often find the link between financial economics and equilibrium theory hard to grasp, less attention is given to purely financial topics, such as valuation of derivatives, and more emphasis is placed on making the connection with equilibrium theory explicit and clear. This book also provides a detailed study of two-date models because almost all of the key ideas in financial economics can be developed in the two-date setting. Substantial discussions and examples are included to make the ideas readily understandable. Several chapters in this new edition have been reordered and revised to deal with portfolio restrictions sequentially and more clearly, and an extended discussion on portfolio choice and optimal allocation of risk is available. The most important additions are new chapters on infinite-time security markets, exploring, among other topics, the possibility of price bubbles.